Historic downtowns have always served as the traditional gathering place for parades, festivals, celebrations and other community events, but what is a downtown’s most important asset? Its most important asset is significantly its historic fabric. Jefferson County has over seventy sites officially classified through the National Register of Historic Places and Historical Society of Wisconsin Register. The recognition and rehabilitation of historic properties creates an atmosphere that honors an important cultural and ethnic past while attracting vibrant businesses and people to the downtown. Each community in Jefferson County has a richly defined character through an attractive downtown district. It is no surprise that three communities in the County have received the coveted “Main Street Program” designation through the state Department of Commerce’s downtown revitalization efforts. The Wisconsin Main Street Program’s emphasis on historic preservation means that they recognize the unique and impressive value of Jefferson County’s historic building inventory and dedicated citizens. That recognition of value through the honoring of our ‘sense of place’ instills pride in our residents; a pride that makes us an interesting, people-friendly place to visit. To enrich that sense of place further, many of the communities have or are in the process of developing downtown river or waterway enhancement plans. Through careful planning these communities are maximizing this waterfront property with walkways, aesthetic improvements, art placement and educational components. The overview on the following page shows part of the plans currently being pursued in Watertown. 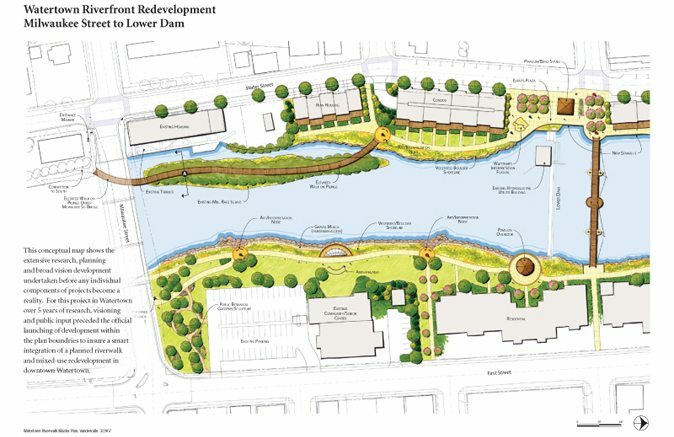 Fort Atkinson, Jefferson, Waterloo and Whitewater also have projects being developed. In Jefferson County, like many American communities, one can find meeting halls and theaters bearing the name “Turner” or “Turn Verein.” The Turner movement, founded in Berlin in 1811 by Friedrich Ludwig Jahn, had an enormous impact on the development of American gymnastics, both as a sport and as a formalized program of instruction within the public schools. Turner Hall in Watertown has remained active, even within the last few years, with providing gymnastics training and support to the community. Plattdeutscher Verein (Low German Club) of Watertown, Wisconsin. The Verein was founded in 1882 with a twofold mission: “fraternalism and the perpetuation of the German language, especially the Plattdeutscher tongue.” Low German (Plattdeutsch) dialects derive from the “lower” (flatter) regions of the north, from which many immigrants to Wisconsin hailed. The Plattdeutscher in Watertown still provides catered meal service to fund scholarships. In 1874 a German singing group, the Concordia Music Society, purchased and named Concordia Island, currently Tivoli Island. Concordia Island served as a host to many saengerfests, music festivals in which most of the singing organizations of the state would take part. When later renamed to Tivoli Island the park became a renowned destination for an annual picnic of Bohemian immigrants from around the state. Watertown’s original settlers were mostly of Yankee or Irish descent, typical of the farmers settling Jefferson County. Probably no Irish family was as influential as the Rogans. Patrick, James, and Peter Rogan were Irishmen who came from New York. Patrick Rogan (314 W. Main St.) was the most well-known of the brothers. It was Patrick Rogan’s donation of land that provided a site for St. Bernard’s Church to build on in 1844. Soon the Yankee settlers were joined by massive numbers of Germans. In fact, the German immigration to Jefferson County and Watertown was so significant that by 1917 seventy to eighty percent of the population in the county was of German heritage. Although there were pockets of Yankee, Irish, Bohemian, and Welsh settlers, the Germans, by virtue of their numbers, were the most significant in terms of the number of institutions and cultural traditions they formed and maintained in the community. The primary destination of the German Catholic emigrants was the Watertown, Wisconsin area. In the early 1850s, Watertown, with about 5,000 inhabitants, was one of the largest cities in Wisconsin. The area’s abundant rich, rolling farmland, some of which had been partially cleared by earlier settlers, would have appealed to Landskroners wanting to farm their own land in America. Wisconsin had become a state in 1848, and southern Wisconsin was no longer considered part of the western frontier. Railroads were starting to connect the major towns in the state, and farmers were able to sell their surplus product on the market. Watertown had a German Catholic parish (Saint Henry’s) founded in 1853, a German newspaper, the Anzeiger, and a brewery. The Moravian congregation in Watertown also has its roots in the pioneers who came here from Germany in the mid-19th century. Also of note are the Scandinavian settlers to the region. The Southern Unit of the Kettle Moraine State Forest has three historic buildings, the Emerson, Oleson (Skoponong Settlement) and Gotten log cabins. Interpretive signs near the buildings explain the cultural history of the sites. Also within the Forest is Old World Wisconsin, considered to be America’s largest outdoor museum of rural life. This site has many displays, such as ethnic farmsteads, that include furnished houses and rural outbuildings and crossroads villages with their traditional small-town institutions. Currently, Jefferson County’s largest immigration population is within the Hispanic community. With partial funding from the County, the Jefferson County Literary Council, as a non-profit agency, has expanded its mission through volunteers to serve this population with English language tutoring. Jefferson County residents are proud of their environment and are progressive about protecting and enhancing it. They are fortunate to be in a state which has benefited greatly from the progressive leadership of such visionaries as John Muir, Aldo Leopold and Gaylord Nelson. The legacy of these dedicated environmentalists is the ethical dialog as well as the legal framework they put in place, which has not only guided Wisconsin toward responsible stewardship, but has also had an impact world-wide. Here in Jefferson County, Aldo Leopold left his mark at Faville Prairie, now a state natural area just north of Lake Mills. He fought to preserve this remnant of the once extensive Crawfish Prairie, with its rare native plant and animal communities. Moving forward in time, today many people and groups are working to protect local environmental resources. The 1500 acre Zeloski farm, just west of Rock Lake, once famous for the potatoes that grew there, is now home to more than 165 bird species, who either nest, rest or migrate through this restored wetland. In many ways partners epitomize the success in environmental protection that occurs here. The Zeloski Wetland Restoration (see page 89), is a good example of how citizens work with agencies in the county to multiply benefits. Citizen scientists are documenting changes as the land returns from farmland to marshes and prairies. The Rock River Coalition, a non-profit organization headquartered in Jefferson, trains these volunteers to measure a number of critical habitat indicators. Its volunteers are measuring the return of birds, dragonflies and even frogs. What makes this effort even better for community enjoyment is that the Glacial Drumlin bike trail transects the site, just west of Lake Mills and Rock Lake, making it a great destination for families, birdwatchers and nature lovers. Throughout the area, citizens are also coming together to measure stream water quality, providing important base-line and trend information for the Jefferson County Land Conservation Department and other agencies. These citizens are trained via workshops and are offered advanced training to become certified stream monitors. They go through a certification process to insure the quality of their data. In recognition of their work, some have been chosen by the State to collect more advanced information in selected locations. Another featured gem is the small but fabulous Allen Creek Watershed, just south of Fort Atkinson. Here local individuals have discovered rare habitats including another remnant prairie and an even more endangered alkaline fen. Currently they are working to document the species and habitats along this 8 mile stream that flows into the Rock River in southern Jefferson County. They have discovered uncommon species including the threatened Blandings Turtle and the Least Darter (a small minnow-like fish), a species of special concern in Wisconsin. This group of interested citizens, professionals and farmers are using a scientific approach to determine needs and related goals to protect the creek, a state Exceptional Resource Water. Protecting our environmental heritage is often a team effort of state and local government partnering with area citizen groups. One significant program in the County resulted in the development of a fish ladder at the City of Jefferson Dam. Here both the desire to retain enough depth behind the dam for recreation and allowing fish to move up and downstream of Jefferson have been achieved. Fish, that winter in Lake Koshkonong, can move the entire length of the county’s portion of the Rock River all the way to Watertown in the spring looking for spawning sites. Citizens of Fort Atkinson, led by the “Heart of the City” organization, are taking a different approach by developing and promoting The Atkinson Diet, a low-carbon diet. This is an innovative way to address concerns of excess carbon dioxide emissions. Other groups have worked to protect our surface water and groundwater by establishing rain gardens. These functional gardens are not only beautiful; they collect and slowly infiltrate the rain water instead of having it run off to our lakes and rivers. Educational rain gardens can be found at many locations, including the Jefferson County UW-Extension office, the Watertown Senior Center and the Town of Oakland town hall. What do all of these efforts have in common? They are a sign of what Jefferson County residents love about their home – protected open space, functional landscapes, clean air and water based on the development of partnerships and backed by good science resulting in enhanced quality of life. Aztalan Park contains one of Wisconsin’s most important archaeological sites. It showcases an ancient Middle-Mississippian village and local Lake Woodland Village ceremonial complex that thrived between 1000 and 1300 A.D.. Beginning in the 1920s, the site was extensively excavated, and two of the four platform mounds as well as segments of the wall have been reconstructed. Archaeologists know that the occupants have cultural traditions in common with Cahokia, a large Middle-Mississippian settlement near East St. Louis, Illinois. Recent evidence suggests some may have actually been from Cahokia itself. The people who settled Aztalan built large, flat-topped pyramidal mounds and a stockade around their village. They hunted, fished, and farmed on the floodplain of the Crawfish River. Portions of the stockade and two mounds have been reconstructed in the park. The General Atkinson Mound Group in Fort Atkinson is another prime example of impressive ancient historical culture. When white settlers first arrived in Wisconsin, the landscape was already dotted with some 20,000 Indian mounds. In Jefferson County alone, there were at least 700 mounds. Now Indian mounds were not uncommon, but effigy mounds – or mounds in the shape of an animal – are unique to the Wisconsin area. Most experts agree that effigy mounds were built about one thousand years ago, but why they were built is still unclear. The southern part of the General Atkinson Mound Group is preserved in the Jefferson County Indian Mounds and Trail Park, south of the community of Fort Atkinson. These eleven mounds consist of tapering linear, conical, bird and “turtle” mounds. The turtle mounds may actually represent panthers or water spirits as viewed from above, rather from the side. The park includes an Indian trail that was documented by a land surveyor in 1835. This intaglio, as it’s called, is in the shape of a panther, and is now marked by a state historic marker in the 1200 block of Riverside Drive. Back in 1850 when Lapham did his survey, there were a total of eleven of these intaglios in Wisconsin. Many were destroyed by land owners and roads but now, thanks to a campaign to preserve this unique landmark led by the Daughters of the American Revolution and thoughtful city officials back in the early 1900s, the city of Fort Atkinson can boast that it has the only intaglio left in the entire United States. In fact, in all the world! Finally the newly expanded Hoard Museum contains one of the state’s finest collections of Native American artifacts. With over 4,000 archaeological artifacts, the Native American Artifacts Room details the prehistory of the American Indians who lived in the Jefferson County area. The collection contains stone, copper and bone tools, as well as pottery and historic fur trade items. Scheduled to open in the Fall of 2008 is a two-story exhibit entitled “Mysteries of the Mounds,” which will tell the story of the first people to live here and the mysterious landscape they left behind. Included in the exhibit is a small theater where visitors will enjoy a 15 minute video presentation. During the presentation a large relief map of an amazing corridor in Jefferson county will be used to point out Lake Koshkonong and the many early settlements on its shores; the mysterious effigy mounds unique to this region; the panther intaglio, the only intaglio left in the entire world; and the amazing site of Aztalan – all helping visitors to understand the rich heritage of this area. The main gallery will include information on the very first people to live here. There will be a Late Woodland diorama and mural of Native American life during the time of moundbuilding, and exhibits on the mounds at Aztalan. A mezzanine on the second floor will house the museum’s outstanding archeological collections as well as host private collections on loan. It is intended for the exhibit to function as a gateway sending visitors and scholars throughout the region to visit and discover the area’s earliest heritage. The Hoard Museum is located in Fort Atkinson on Whitewater street and admission is free.